Desperately in need of surgery to alleviate the ravages of sickle cell disease and previous medical care that worsened his condition, Abiodun Bakare a university student, was about to give up hope when he discovered the cost of his surgery would be N18 million (about $50,000). Bakare, his family and friends had done their research and discovered that a hospital in India could provide him with the care he needed, but the cost of the care and the journey was well beyond his reach. Digging deeper, Bakare was determined to solve his challenge locally, and finally his search connected him with a hospital in Nigeria’s northern state of Sokoto where medical experts agreed to perform the operation for a nominal fee. Bakare’s friends jumped in, launched a social media fundraising campaign, and pulled together the money needed for the operation. However, Bakare still had to overcome one huge hurdle: how to get to the hospital. The 18-hour overland journey was out of the question due to Bakare’s critical condition. Fortunately, a friend stepped in again and discovered a solution: Flying Doctors Nigeria, which agreed to fly Bakare to the hospital free of charge. The offer reduced a journey that would have taken longer than a day, to just over an hour. “I knew we had to support Bakare with air ambulance services because it would have been impossible for the student to pull together the funds to pay for the service,” explained Dr. Ola Brown, founder of Flying Doctors Nigeria, West Africa’s first and leading indigenous air ambulance service organisation. The news came as a surprise to Bakare. “I didn’t even know there was an air ambulance service in Nigeria. I thought these services exist only in the Western world. My health condition opened my eyes to the fact that this kind of service is available in Nigeria,” Bakare later said. He appreciates the support of Flying Doctors Nigeria and understands its value. “This is a journey that the firm could charge over a million naira for. It is still like a dream to me that this kind-hearted firm would intervene in my situation and provide their air ambulance services at no cost to me,” he added. Dr. Ola Brown says that there are a number of reasons air ambulance services are essential to both the patient in particular and the healthcare community in general. “The first hours of an emergency situation are critical and the life of individuals shouldn’t depend on how far they live from the medical facility best equipped to handle their injury or illness,” she said. “And we know that the sooner patients receive the proper care, the sooner and better they recover,” she added. Dr Ola Brown established Flying Doctors Nigeria almost 10 years ago. Since then, the firm has saved lives across the West Africa sub-region, including infants, children, and pregnant women. 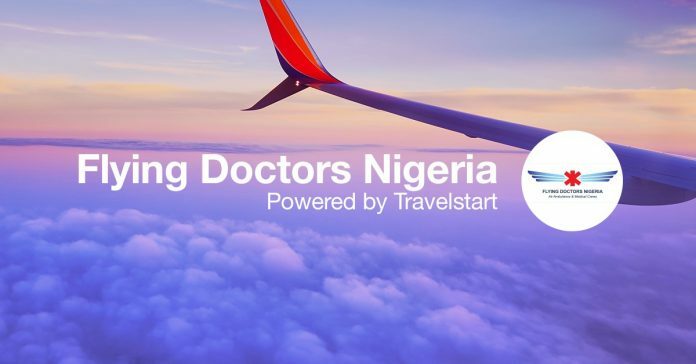 Corporate organisations, such as those in the construction, mining, oil & gas industries, have also come to depend on the services of Flying Doctors Nigeria. Born, raised and trained in the UK, Dr Ola Brown graduated as one of the youngest medical doctors in England. She is also a trainee helicopter pilot. She leads a team of 50 emergency healthcare professionals from the Flying Doctors Nigeria base at Murtala Mohammed Airport Lagos where their aircraft is located.